This doesn't happen frequently folks!! I mean, he'll chuckle sometimes, but everyonce in while the man LAUGHS!! 4:30 am Tuesday, after a crazy Monday of allergy tests, I awoke to pretty excruciating pain. I normally hem & haw when deciding to go to an ER or not, but I jumped out of bed and got dressed. We threw the kids in the car and I moaned and writhed the whole way there. The kids were very upset and I felt so guilty, but I couldn't seem to keep myself under control. Stephen drove us to one of several local ERs...he picked the one he thought would have the shortest wait...we've had good experiences there before. He pulled up to the door and before he could walk around to let me out, I crawled out and into the ER door on my hands and knees moaning. Stephen yelled for a wheelchair and had to figure out how to get the van parked and kids inside. One nurse came to help me. Another came out and yelled, "Seriously?! What is going on here?" I couldn't answer and she angrily crossed her arms over her chest and watched me get into the chair. She and another nurse followed the one pushing me in the wheelchair and they laughed at me and made fun of me crawling in. I didn't really care...at that moment, I just wanted the pain to stop. I was taken immediately to a room, which was a blessing, however no one would assist me as I fumbled and crawled when they told me to get on my stretcher. They tossed a urine cup on my bed and told me to get a sample. Then three of them watched me struggle to get down, while crying and crawl to the bathroom. Trying to sit on the toilet and pee was excrutiating. I was noisy with pain, but I managed it and crawled back to my room and got back on my bed, all while being glared at by my nurse. Then the pain started to just send my body into jerks and I started vomiting. My nurse got mad at me and yelled at me to stop moving so she could get my IV in. I tried. I suddenly remembered that I needed to warn her that painmeds and nausea meds make my blood pressure drop. It seemed important. When I told her, she glared at me and said sharply, "Well, we have to give you something!" Which, of course, I agreed with and very much wanted them to do. But she never checked my blood pressure. She just injected me with painmeds and walked out of the room. I didn't see anyone for quite sometime. I knew Stephen would want to come, but he and I had agreed we didn't want the kids to see me that way. Mom and Paul were on their way to pick them up. After a while, they must have decided I needed nausea medicine, they gave it to me and all I could see was white. I told my nurse that I was about to pass out. She told me I was fine. I kept trying to put my head down and move my feet to keep myself awake. She got upset and told me to stop or I'd fall off the bed. She left. A much kinder nurse came to roll me away for a CT scan. I told her I felt like I was passing out, but she too told me that I was fine. They were right, I never passed out, but I was so terrified I would and no one would check my blood pressure. And they would just leave me. A little later Mom and Stephen came in and stayed with me. Everyone was much nicer by this time and my awful nurse had left as far as I could tell. A Dr stopped by and informed me that I had 2 stones. The big one had already dropped into my bladder and would pass easily. A smaller one was behind it, but shouldn't be a problem. She'd send me home with pain meds. She said all this from the door and never came in....she said it quick and left. Then I was discharged. Paul kept the kids for the rest of the day. Stephen tried to work downstairs, but it had to be hard because he diligently checked on me throughout the day and helped me to the bathroom and brought me food and made me drink water. Paul brought the kids home around dinner time and we put them to bed afterwards. A few hours later I was in crazy pain again and the pills were NOT helping. We called my friend Amy who rushed over and took the kids. We were on our way back to the ER...a DIFFERENT ER this time. They admitted me quickly. I had THE NICEST NURSE EVER! She put up with me when I was feeling fine and happy, she put up with me when I was moaning and writhing. She took my blood pressure regularly, and when it dropped she put my head down and my feet up. They moved me to the urology floor where I also had some of the world's most wonderful nurses. They were beautiful souls who seemed to only want me to be comfortable and well. An on call urologist kindly fit me into his surgery schedule. My anxiety kicked in and my mind started thinking about all those crazy scenarios in which I could die having a stent put it ;) Cause crazy is what I do best! Fortunately they gave me versed quite quickly when they saw me shaking like a leaf. Then one of the ladies from church who works there recognized me and visited me for a moment. By the time she was out the door, I was asleep. I remember people waking me up to have me breath in a mask, then I remember waking up and someone saying, "Look, here's your stone! That's a doozy and it's all out." I looked at the stone and managed to sit up. 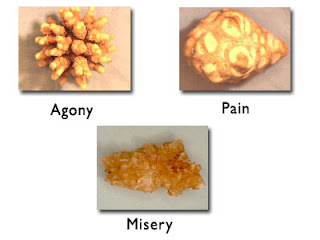 I didn't get to get a picture of it, but I googled types of kidney stones, and mine looked like the one labled "misery" below...maybe a bit more uniform in shape. The room was full of people waking up with no curtains or dividers. I didn't like it and I didn't like that Stephen wasn't there and I felt a little nuts. A lady told me to lay down, it would be an hour before I could leave. I asked what I must do to leave. She told me I had to urinate twice. I told her I needed to pee. She brought me a bed pan right there in the open, crowded room. Thank goodness for the long hospital gown. After I was done and she took it away, I asked her to bring it to me again. When I was done this time, about 2 minutes had passed from when she told me it would be an hour til I could leave. She smiled at me and had someone roll me to my room. Thank you, whoever you are, SO much! Stephen had gone to pick up things from home and to check on the kids. Mom, Paul, and my aunt Phyllis were in my room waiting on me. I got to stay in that glorious tiny room with those fabulous nurses for a little while. Then my urologist decided to move me to cardiology due to my syncope :( I'm sure they are lovely ladies, but they couldn't answer any of my questions, nor did they try. I was often told, "I'm not sure, I'm a cardiology nurse." They were just as confused by my presence as I was. And they weren't nearly as enthusiastic about pain management as the urology nurses were. And that was okay....for a while. My friend, Mandi, visited and brought us pizza...yummmy! And that was lovely, because I actually felt good for a while and the pizza was awesome and the company was even more pleasant. Stephen was slipping quickly into exhaustion at this point...he had had about 4 hours of sleep in the last 48 hours. That night, the pain came back and I started to be able to tell that I had a stent in. The pain kept me awake and I became over aware that my bed would inflate in places and deflate in places literally every 60 seconds. And whenever I bent my arm a bit my IV pump would angrily beep. When the nurse came to check on me and I was sitting in an awkward position while whimpering a bit, she finally had mercy on me and gave me morphine. Then I slept...and Stephen slept...and all was well. The next day my aunt Rita visited. My pastor visited. Stephen and I waited to be discharged....A LONG TIME. Dad and Janet offered to take the kids for the next few days while I healed. When I finally got discharged, around dinner time, Stephen had picked up the kids from Amy's house and brought them to the hospital. They were elated to see me and I was elated to see them. Iris joyfully thanked every nurse, doctor, or housekeeper for "making Mommy better." We packed up and began the LONG drive home. Every bump in the road felt like a personal offense to my bladder and kidney. I tried to just brace myself and bite my tongue. We got home, unpacked, and repacked the kids. I kept walking around helping because sitting hurt and laying down hurt...it was easier to walk. This was stupidity on my part. Mandi had warned me to stay still. Dad and Janet came and straightened my kitchen and whisked away the kids. I felt guilty that we were sending them away again, even thought I knew they would have fun. But it was such a blessing, because that night a new sensation hit. I've always heard that kidney stones are comparable to labor pains. This is very relative. My first two labors were natural and were incredibly painful. But I know people who say, "Yeah, labor hurt some, but it was mostly a lot of work." Or, "Yeah, it was just so loooong and I was so tired...I was more tired than in pain." Also, I know people who said it didn't hurt at all. This is an enigma to me. Lucy's labor was insanely painful. But compared to Clyde's, it was a breeze. Iris...felt like cramps and that was it...but I got some "mild" epidural with her....the anesthesiologist called it mild, I thought it was perfect. So this kidney stone... The pain on the way to the ER both times was really bad, but I had to be honest, it was not the worst pain I had ever been in before. My screaming, wasn't really screaming, it was more like moaning. When I was in labor...I was SCREAMING! BUT that night after Dad and Janet took the kids, I felt it...that familiar, true scream-inducing pain. I would find out later that it was kidney and bladder spasms. That really just doesn't sound like a proper name for something so painful. It was a nightmare. Stephen was living it with me. He looked like a lunatic when he called the urology on-call person. They told him this was completely normal. It was a spasm. Put heat on it. Drink water. We thought she must be delirious. We put some CRAZY heat on it. I totally expected to find burns the next day. And I drank water like a mad woman. I was ready to go to the ER and certain this would not work. After 45 minutes, however, it actually started to work. The pain stopped, I felt this wave wash over me and I fell asleep, as unconscious as a brick. I slept a nice long time. The next morning my aunt Rita brought me an extra heating pad. Stephen tried to get back to the two jobs he was working when this fiasco hit. But now the spasms were returning with a vengeance and the heat and water weren't cutting it. They were lasting longer, but giving me breaks between. By 12:30pm I was back at the ER. My mom met us there. I was given this bracelet. Yep, I was a fall risk. I quite agree. We were admitted, spoke to my urologist and sent back to the urology floor. This took a long time, for the ER was crowded like I have never seen before! Fortunately, the spasms gave me a nice long break. My Dr gave me this lovely button, that whenever I pushed it, it released relief straight into my IV. Mom offered to stay with me, Stephen went home to sleep, and Sherry came by for a visit. She made me laugh SO hard, and even thought it hurt to laugh, I totally didn't care. Stephen returned at 12:30am so Mom could go home and get some sleep. We slept like rocks there in that hospital room. A pain in my arm woke me up. Then my teeth started chattering. My arm felt cold and like it was going to burst open right above my IV. I buzzed for my nurse. She checked on my arm and called for the IV nurse. A few minutes later this wizened looking, quiet lady who looked to be of Indian descent strolled into the room with all of her IV equipment. She examined my IV. She saw where I had been poked at least 11 times already in multiple veins on my wrists, hands, forearms, and back of my arms. She quietly noted the bruises, noted that these veins were not ready. She found an untouched one at the side of my wrist near the base of my thumb. The tourniquet did not provide the pressure she needed, so she turned to the unused, antiquated, manual bloodpressure cuff mounted on the wall. She slid it on and pumped. But the thing was so old, the tubing leaked. She deftly doubled up a bandage, wrapped it around the leak, clamped it with clamping scissors and pumped again. This time it worked. She stared at my vein intensely. I had been praying before she ever showed up that this IV would go in in one shot, and as I watched her, I thanked God for this woman. She slid that baby right into my vein and had it taped very firmly very quickly. I told her she had beautiful cheek bones. I said she must be the one they call when things go wrong. She just smiled at me and told me what a good patient I was. When she left, Stephen said, "She's MacGyver!" I said, "She's magical. I love her." And I do. My Doctor's partner strolled in after we slept some more. He asked me some questions, and made some callous and rude statements. Then he asked to see my suture. Here's the deal. I didn't really have a real suture. What he was referring to were the strings which were fastened to the stent. The stent is like a long skinny straw with a spiral at each end. The spiral is stiff enough to be spiral when nothing is tugging on it, but it is a flexible straw and can be straightened out if pulled. One spiral sits in your kidney, the straw follows your ureter down to your bladder where the other spiral sits. This end is attached to a string which comes out of your body so you can pull on it to remove the stent. My Dr, his partner, chose to tape this string to my lower belly. When this Dr saw the "suture" he haughtily said (and Stephen can verify this), "Well, I am not going to remove THAT since it's taped THERE!" (Remember, this man is a UROLOGIST) "You go ahead and get that out of there, you may have some more spasms when you do...I'll check on you in a few hours and discharge you." He was about to walk out. I stopped him, "Excuse me, but how do I pull it out?" He just stared at me. I said, "Do you pull it fast or slow or what?" He said, "Well, how do you like your bandaids?" And he walked out!! I looked at Stephen and said, "If it hurts so badly that I can't finish pulling this thing out by myself, are you willing to do it?" He said he was. So I mentally prepared myself and pushed my pain relief button. We were just getting ready to pull the thing out when the nurses walked in. When they asked why we barricaded ourselves in the room like a fort, we explained that we were getting ready to pull my stent out. They looked at us funny and said the Dr had told them to do it, why were we doing it? So, I'm incredibly thankful they walked in when they did. I felt bad for them having to do it, but when I apologized, they didn't seem to mind at all. The spasms came again and were pretty rough, but this time I had pain management and they eventually passed. They would come again more mildly every once in a while. I was discharged again and this time, I was pretty sure would be the last visit. It was now Saturday. Once home, Stephen checked the mail and brought me a couple of cards. Here's the cover of one that a gentleman in our church family made for me :) Stephen and I got a good laugh out of it...so did the kids once they got home. We went home, slept all night and a good bit of Sunday. Dad and Janet brought the kids back Sunday. It had been nice not having to worry about them during this whole experience. First with Paul, then Amy, then with Dad and Janet! They had such a good time, but we were all so happy to all be back together! I'm still recovering...it's surprising me how long it's taking, but I'm just thankful the bad parts are over!! And I've got my babies back!! And I have such awesome family and friends who really took care of me and everything else so I didn't have to worry :) Thank you, Lord, for them all!! My children got completely showered with Valentines this year. Of course, we're a bit spoiled, not much of holiday can go by without a little pampering from Momma or the grandparents. First, Grandmom and Grandad surprised them with hamster webkinz, then they got cards and candy from Nana, and cards and money from Nena and Papa. So, thankyou Grandad & Grandmom, Nana, and Nena & Papa, they thoroughly enjoyed their grandparent-love!! They, of course, had their homeschool party, where they each got a box full of fun valentines from their friends. And, in spite of all this, I tried, but couldn't resist having something small for them Valentine's morning. I made them each a bookmark from a paint sample (thanks pinterest! ), gave them each a pencil, and the girls got a few Squinkies, while Clyde received a mystery lego figure. I gave a deep sigh of relief when I heard him yell in excitement after opening it and I finally knew for sure it wasn't a 'girly' lego figure! We tried to do school as quickly as possible, pick up some Chik-fil-A, and get to the local zoo! They have some new foxes (and other animals) that Clyde has been just itching to see. The wanted a picture with the Capybara...they're always so impressed that it's the world's largest rodent. Sometimes their excitement leads me to believe that they think that THIS PARTICULAR capybara is the world's largest rodent. The kids must have spent a full 20-30 minutes playing with the cotton-top tamarins. They've had these little monkeys as long as they can remember, but they've never been this entertained by them. They kept jumping over and putting their hands against the kids hands and trying to lick them through the glass. Iris fell madly in love and literally started crying (real tears!) when she found out that you can't keep tamarins as pets without a special license. We had several cool encounters that we don't normally have. The crowned African cranes put on quite the rhythmic concert for us. Lucy sang lullabies to the goats. A peacock walked right up to us and fanned out his tail...I was late with the camera. Then Clyde starts singing, "I'm a pretty girl peacock, spread your tail back out for meeeeee!" The girls and I were cracking up. We got to see one of the Snow Leopard kittens. Her momma came out yowling like crazy for her, but she refused to answer. The closer Momma got, the more hunkered down Baby got until finally Momma rounded the corner and Baby pounced on her. Then we watched them wrestle a while. As we were leaving I was just strolling by the crow cage when all of a sudden it said "Hi!" in my ear like a person, quite loudly. I jumped and screamed. The kids thought this was quite delightful. We dropped Clyde off to go rock climbing with Stephen and the girls wanted to do something girlish. Immediately, I thought, "I've never had their nails done!" For that matter I only had MINE done on my wedding day. So I took them to a random nail shop. Here's what they chose! It was a very fun Valentine's Day! It was sad that we didn't get to hang out with Daddy more (except Clyde), but that's just how it is sometimes, but the company was fabulous just the same! This year, I PLANNED on having a valentine's party for the homeschool families from church at my house. I did a kind of poor job putting the thing together. First, I accidentally left out some DEAR families :( Secondly, I realized, late in the game, that my house would not safely hold that many children so party would have to be moved. Thirdly, I did not plan any activities in preparation for possible bad weather. With all that said, aside from the missing families, it went quite well! We anticipated 39 children at one point, so my kids each went off to make 38 valentines. Iris made foam heart tic-tac-toe boards. They look like this on the back...that's an envelope holding small foam hearts for the recipient to use in playing tic-tac-toe. Here is the front of the board, I put some of the small hearts from the envelope on the front, so you could see what it looks like while being played. Here she is with her decorated box (I wrapped it in pink for her and let her go to town on it.) and her 38 valentines. She had separate piles for girls & boys. Here he is with his box and 38 valentines. He saw a kit to make a box the other day, but it cost $13. I told him I could do it for free with what we had at home. So I surprised him with this box the morning of the party and he was quite happy with it! Lucy made felt fortune 'cookies'. Here is one up close. Here she is with her box (I wrapped hers in pink too, and then let her decorate it.) and her 38 valentines! My strawberry cupcakes! They didn't taste as strawberry as I hoped, BUT they are dairy, artificial dye, treenut, peanut, orange, coconut, and artificial flavor FREE!! Not only that, but they turned out cute!! Which is hard without dye, people! The playground was cold and wet, but the kids didn't mind too much. They definitely went home muddier than they came! Surprise, Iris!! Happy 7th Birthday! !